The mission of Bloomfield College is: "to prepare students to attain academic, personal and professional excellence in a multicultural and global society." 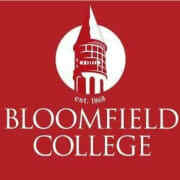 History of Bloomfield College. The origins of Bloomfield College go as far back as 1868 when the German Theological Seminary of Newark, New Jersey was founded by the Presbyterian Church. It was relocated to Bloomfield in 1872, taking up residence in the former Bloomfield Academy at Franklin and Liberty Streets. Would you recommend Bloomfield College?